WELCOME TO KALOKAIRIE DALMATIANS..... A SMALL HOBBY KENNEL SITUATED IN YORKSHIRE, ENGLAND, EST 2000. Please browse our pages to see our family life with our show dogs. 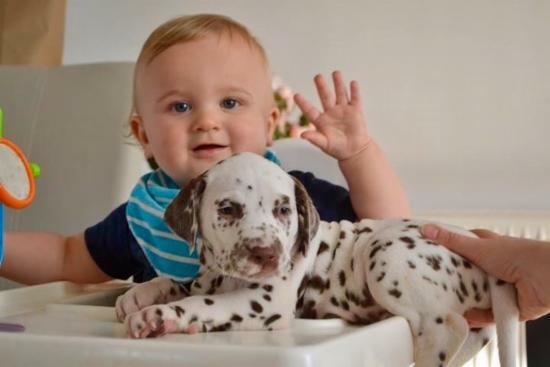 Feel free to contact us via email @ kalokairie.dalmatians@gmail.com . we are always happy to help and advise on any aspects of Dalmatians where possible. We actively breed to maintain our established breed line, for further information on future litters please email us. 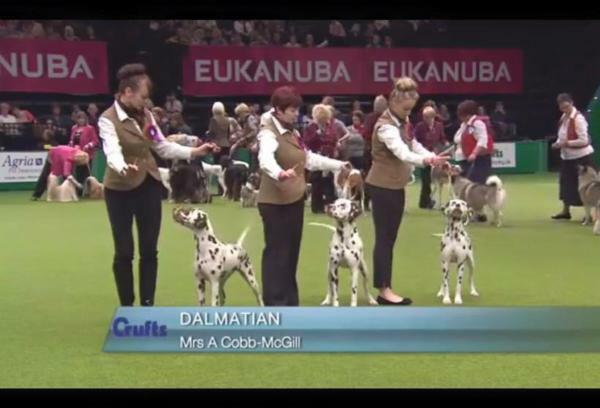 Kalokairie's Breeders Team, Representing Dalmatians at Crufts 2014. Pictured successfully reaching the Final 8 , from over 52 UK breeders . An all Liver team comprising of siblings from my Lord and Lady litters ; Dazzle, Forrest & Autumn. Kalokairie's Eddie the Eagle as a puppy on BAER testing day pictured with our son Aspen. We rear our litters in a home environment to ensure they get the very best start with socialisation and training skills.